The wonderful thing about board games is that they cover just about every conceivable idea. From recreating the most harrowing battles over several hours in minute detail to speculating about how mankind might one day inhabit distant planets, I think I’ve just about seen it all. The same can be said of game mechanics, too, from card drafting and dice rolling to worker placement and set collection. Yet somehow, the very best games often manage to combine these mechanics or revitalise them in interesting ways. 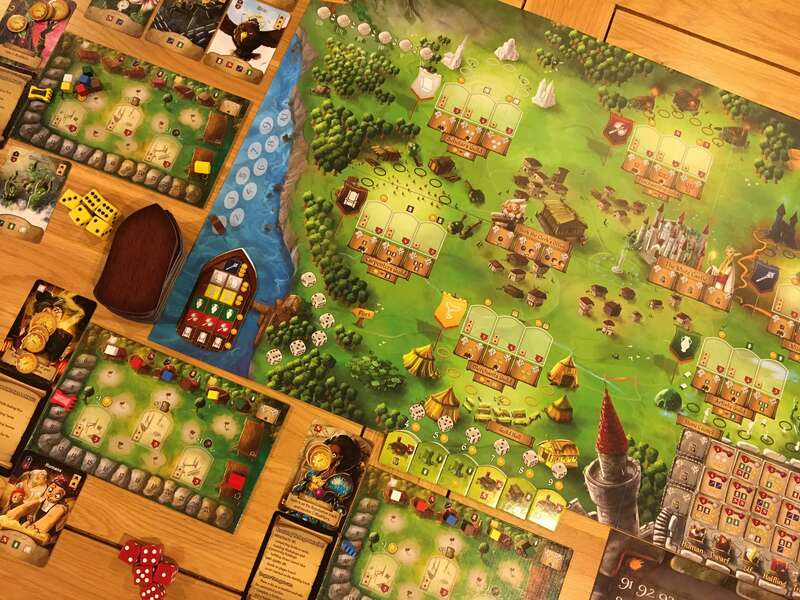 Rise to Nobility does exactly that, delivering a twist on a common theme that is further underpinned by a number of straightforward, interlinking systems that will be immediately familiar to most players of Euro-style games. Rise to Nobility describes itself as a dice placement’ game for one to six players. In solo mode (which I won’t cover in much detail because I’ve only tried it once) the solo player draws from a solo objective deck. With two or more players, the aim of the game is to score the most victory points. To do this, players recruit settlers, develop guilds, build their reputations and ascend through the noble ranks. Along the way, six different kinds of resource will be bought and sold, apprentices will work the guilds, building permits will be issued and the Stone Council will grant permits to those who can afford them. Whilst not wholly unique in isolation, the dice placement element of Rise to Nobility is undoubtedly the most interesting because of how the game influences the use of dice in different situations, which is something I’ll explain in more detail later. 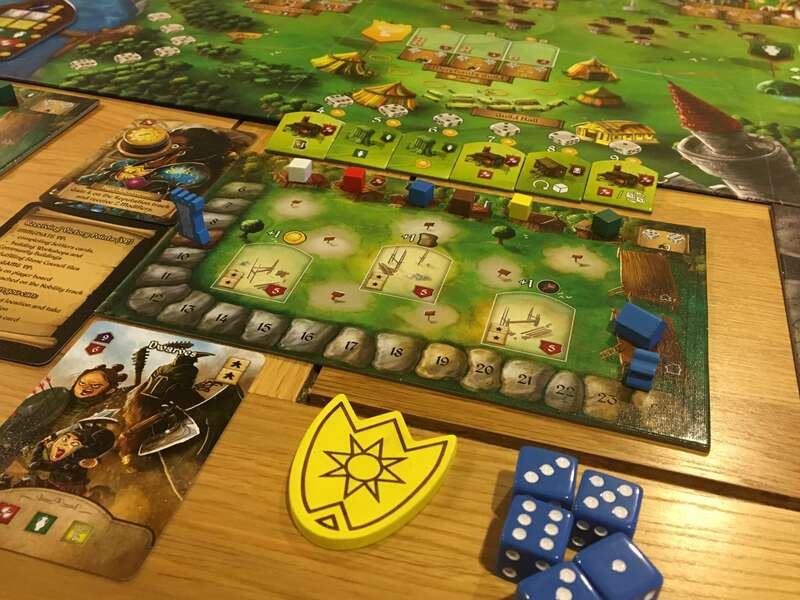 Aside from the dice placement element, Rise to Nobility is largely about action efficiency, with several engines that must be established and operated. For example, settler cards are first ‘recruited’ from the Cavern Tavern (which is indeed the titular tavern from Final Frontier Games’ previous release) and then ‘completed’ — which means paid for. When this happens, the player often loses score points and/or receives meeples, which must be placed in houses on their player board. 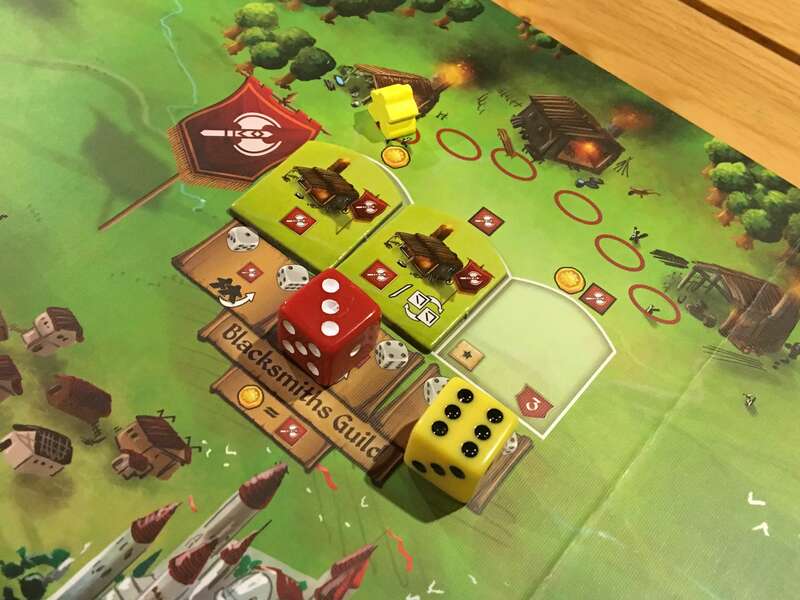 After the first house, placed during setup, players must pay for additional houses by placing dice. Once a player has a meeple, they may place it in a guild to gain additional benefits from the guild. And so the cycle continues until enough wealth has been accrued to work with the Stone Council, developing both the main board and individual player mat further with buildings etc. Rise to Nobility has a ‘point salad’ kind of feel to it, with multiple routes to victory possible, although it is possible to find yourself well behind should you fail to properly see a strategy through. There’s no doubt about it: Rise to Nobility is an incredible looking game which comes in a box literally bursting at the seams. Since I opened it, I just haven’t been able to close it properly, no matter how hard I’ve tried — there is a little bit of overproduction, but frankly that’s not a word I’m using in a negative context. As an example, both the main board and all six player boards are double-sided, with day and night sides offering no difference in gameplay. Similarly, look at all the wooden pieces — there’s a massive shield to represent the first player, there are tiny houses and wooden people, there are scoring disks, little painted towers and even a ship to represent the current turn. The artwork on the boards (both sides) is exceptional, much as it is on the decks of cards. Rise to Nobility depicts several different races and each is represented several times in the settler deck. Even so, the artwork is varied even among individual races, which is a really nice way of further immersing players in an already attractive world. I haven’t mentioned them yet, but there’s a tonne more wood and cardboard in the box — not to mention those amazing sets of dice. There are a load of random ship cards to indicate the demands of different overseas traders, then there are building tiles (in a velvet bag) and Stone Council tiles to place on the board. The manual looks equally fantastic and is reasonably easy to digest, although I had a few minor problems with some of the rules. As an example, it took me a long time to decide what mix of resources could be used to pay for a settler card over and above the minimum, mandatory resource types shown on the card. Unbelievably, the base game also includes a fairly hefty expansion called ‘The Chancery’ which comes with a whole new board as well as a number of additional tokens and pieces to throw into the mix. All said, if you like the sound of the game, you will most certainly not be disappointed with the components in Rise to Nobility. Turns in Rise to Nobility are deceptively simple and can often be fairly quick. Each player initially rolls all five of their dice, then takes turns to place dice and complete settler cards (either or both of which can be performed on a single turn). Now the really interesting bit that I mentioned earlier relates to when and where players are able to put dice down. Firstly, the number of spaces at each location reduces based on player count (which is fairly normal) but individual spaces (even within a single location) may have restrictions about which die scores can be placed there. For example, some locations can only be accessed by placing a die showing a face that is either higher or lower than any other dice already placed. Other locations give certain benefits to specific die rolls — for example at The White Castle, a five or a six provides three reputation points, whilst any lesser roll provides less. Is it really worth placing your die there second or third? Well, maybe it is, because the other interesting thing about Rise to Nobility’s dice system is the way dice placement is controlled. No matter what score they roll, players may only place a cumulative value (across all dice) of equal to or less than their personal reputation. At the beginning of the game, the players have just eleven reputation, so basically it’s possible to place two threes and a five, or maybe five twos and a one. 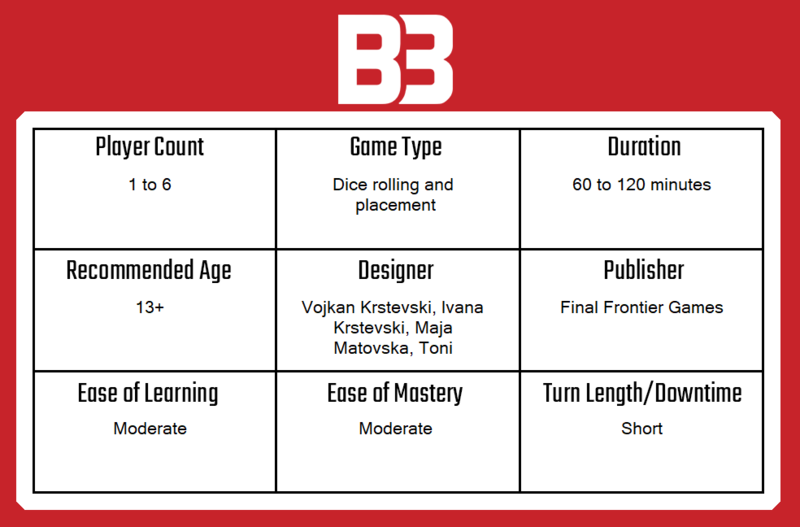 More often than not, any player will need to build up their reputation in order to play four or even all five dice. This system does a good job of mitigating some of the randomness that an almost entirely dice-driven game can bring — if you roll low, you’ll likely get to place more dice, whilst if you roll high, you’ll do more powerful things. Whatever you choose to do with your turn, it turns out that dice placement is just as simple as worker placement. It involves simply placing a die, then taking the benefit, which may or may not be enhanced by a building or apprentice placed earlier. 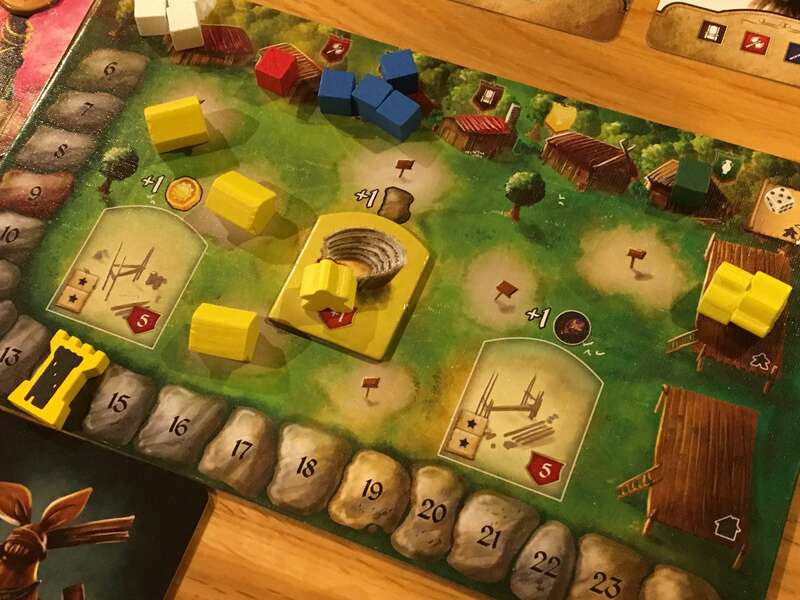 Should a player wish to complete a settler card, they must have first claimed it from the Cavern Tavern by placing an appropriate dice. They may then choose to complete that settler by paying a number of resources that is between the range shown in red and blue on the top left of the card. 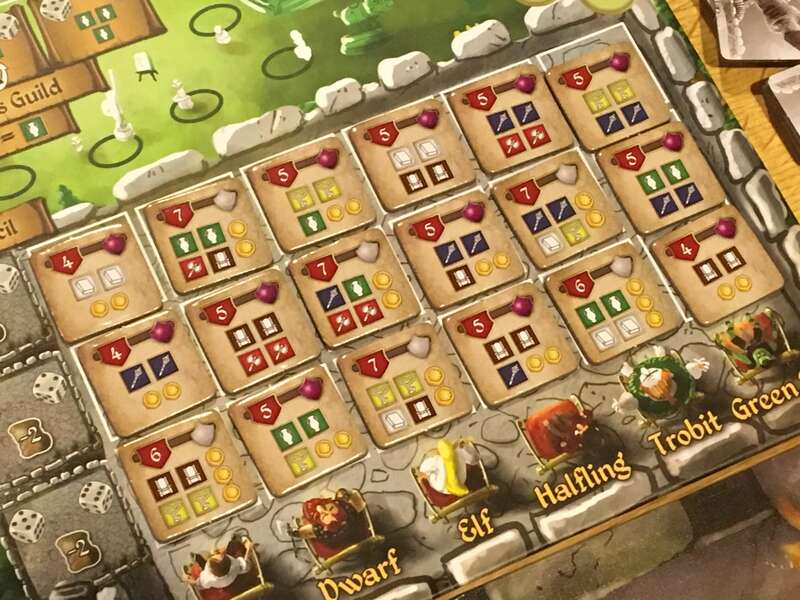 For example, a dwarf card that rewards the player with two meeples may pay between six and nine resources in total (and will receive an amount of points equivalent to the value spent) as long as they pay the resources shown along the bottom of the card as part of the total. In this example, that would require one red, one green and one yellow resource. As I said earlier, the manual wasn’t clear about whether or not the other resources needed to be from those types or not, but I decided that it didn’t make sense to restrict players to just those resources, as long as they met at least the minimum requirement. Once your crew has the hang of Rise to Nobility, I don’t doubt that the game will move along at a fair pace. Each turn can easily be completed in under thirty seconds assuming it was planned in advance and no one has pinched the space that the player in question wanted (which does happen fairly often). I’d say there is no circumstance where the game slows down beyond the expectations that players of games like Viticulture will have already set. Rise to Nobility is much quicker to play than any of the heavier worker-placement games I’ve played, without exception, and a complete game lasts maybe ninety minutes on average. Firstly, there’s a lot that I like about Rise to Nobility and I am a huge fan of the combination of interesting mechanics (I love the linked dice placement and reputation mechanisms) and the familiar but individual fantasy theme it uses. I am impressed that Rise to Nobility takes place in a persistent world alongside Cavern Tavern but takes things to a different level — I and most of the friends I played with were keen to explore that world further (which we will do in a later review). Teaching players a dice game that uses two different ways to place both cuffs and collar on the impact of luck is much more rewarding, because unlike in some dice games, the possibility of a bad-luck washout is almost impossible here. I also like the way in which the city of Caveborn is built more or less from scratch by the players and again, with the theme, it really begins to feel like a living city populated by interesting characters. The way apprentices kind of move from settler cards onto player boards (in houses that have to built) and then onto the board for an occasional benefit feels a bit like hard work, but ultimately I have found that setting up those engines is fairly key to success in the mid to late game. On that note, The Stone Council works well thematically (you need to have completed settlers of certain races in your workforce in order to access the scoring tiles) but it feels like a weak way to ditch resources late on and little else. I think I would have liked to see Stone Council tokens deliver alternative benefits. The speed of Rise to Nobility relative to the strategic nuance of the gameplay (which is a fair amount when you consider the dice placement, the engines that need to be built and the level of efficiency youl need to reach to win) is something I admire greatly. I think even Viticulture, with its organic flow and simple central board, bogs down more than Rise to Nobility as different grapes, cellar upgrades and so on come into play. Without doubt, Rise to Nobility is lighter than super-heavy Euro or worker-placement games like Lisboa, for example, but it does occasionally achieve similar levels of engine-building power without asking nearly as much of the players. The worker placement genre is very crowded at the moment, I have to admit. Rise to Nobility has been out for a couple of months now and whilst I feel like it might have been lost among some of its flashier competitors, I personally feel that it has had short shrift. When I read about it elsewhere, I note that people call out that the dice systems in Rise of Nobility lead to luck-based gameplay, but I just don’t agree for the reasons I’ve already outlined. What’s more, the game even includes modifier tokens that can be bought to let players change the score on one die a pip in either direction. In short, I think a lot more care has gone into ensuring balance in Rise of Nobility than it’s being given credit for. At the same time, the engine-building elements come together in a slightly cumbersome way, but they are also powerful and they force forward planning and strategic thinking. If there’s a disappointment here, it’s The Stone Council, which feels like a poor way to pay players back for investing so heavily into building a resource-making machine. Then there are the components. I don’t judge games based on how they look because that can lead to some disastrous purchases, but I do think that theme is important in creating overall interest in a game. Rise to Nobility has tonnes of character in that regard and it is incredibly well put together. I think Rise to Nobility is an excellent way to entice players who are curious about moving from gateway games into heavier worker-placement games, whilst still offering more experienced players the opportunity to get quite deep into the strategic elements of maximising efficiency and engine building. A copy of Rise to Nobility was provided for review purposes. You can find out more about it on the website of publisher Final Frontier Games.